Remain present. Do not allow your mind to drift. Let the person say everything he or she wants to say before you start thinking of a reply. Don’t break eye contact.This way, the speaker will know you are paying attention and that you care. Ask questions to clarify.This is not your turn to speak, focus on what is being said, and if you don’t understand something, ask the speaker for clarification in a sincere way. Acknowledge feelings. When the speaker talks about his or her feelings, acknowledge them. It won’t diminish you to concede that the person is happy, upset, or sad. Try to understand before you ask to be understood. Before saying anything about the situation, make sure you understand the other person’s position. Offer non-verbal feedback. While the person speaks, smile, nod, frown, move your shoulders, raise your eyebrows, or make any other kind of gesture supports what is being said. Respect the silence. It is not bad to remain silent; these intervals let you and the speaker think about what was said, and lets you confirm that he or she has said everything they intended to communicate. After a few seconds have passed, you can talk. Notice the non-verbal as much as the verbal information. There is always a meaning to what someone says and to what he or she doesn’t say, but communicates through body language. Ask for permission. Maybe a person just wants to be heard, or maybe he or she wants advice. Offer advice only if the person wants it and only after he or she has finished talking. If you are not sure about what they want, ask if they want your opinion. One of the most important small business networking tips you’ll ever hear is that active listening is very important in networking. If you need more professional networking tips, then Networking Tips Small Talk 101 is the e-learning course for you. In this course, participants learn about the advantages of active listening, but also learn to apply the P.O.S.E.S. method for small talk. 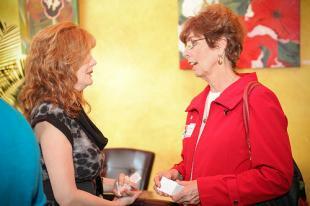 Build the relationships you seek and take your business networking to the next level.